Things I wish I had known. I am writing this to share something I wish I had known in 1970 when I began my career. In September of 2017 I sold my physical therapy practice, essentially ending my 47-year clinical career. I loved my work over that time span and feel privileged to have had the opportunity to be a physical therapist. I had considered my “retirement” for a few years prior to actually being faced with it. Among other activities, I had always planned to do pro bono work as a physical therapist once I had available time in retirement. I live within the collar counties of Chicago and assumed that there would be many available places to provide the desired pro bono work. I was disappointed and surprised to find I was very mistaken. After an extensive search, I discovered only two sites in this area that exist to provide pro bono work inclusive of physical therapy in an outpatient setting. One of these is a large community medical clinic in the heart of Chicago providing care to the uninsured, called CommunityHealth. The second is a small mission on the outskirts of Chicago called Mission Possible. This site splits their work between spiritual ministry and a variety of health care services. A few other opportunities for a physical therapist to provide pro bono work exist outside of outpatient care. Hospitals typically treat a limited number of uninsured patients. Throughout the United States, and specifically in Illinois, some universities with a physical therapy curriculum have student-run pro bono clinics. Rehabilitation professionals, including physical therapists, are part of teams that go to sites in response to natural disasters and into impoverished areas devoid of adequate medical care. These are surely examples of pro bono work, yet the folks residing in our own neighborhoods are often without access to care primarily due to insufficient caregivers and available sites. The state of Illinois has approximately 14,500 licensed physical therapists and physical therapy assistants. Within that group there are approximately 3,000 members of APTA and, therefore, also members of the Illinois Physical Therapy Association (IPTA). The Illinois Department of Financial and Professional Regulation requires that all who are licensed in our state follow the APTA Code of Ethics. Therefore in Illinois, there are about 14,500 of us who have promised and committed to provide or support pro bono work. Clearly, that is not happening. I regret that I am seeing the scope of this problem only at this point in my career but am hopeful that we can change the situation for future physical therapy (PT) professionals. After approaching IPTA about these issues, I was asked to form a committee to explore possible statewide solutions to the lack of ready access to opportunities to serve in pro bono physical therapy. We are in the early stages of this work but presently proceeding with enthusiasm. Other professional groups have provided pro bono services very successfully for years. Some examples include attorneys, physicians, dentists, and nurses. I have met with representatives within these groups to learn details of what was entailed in starting these provisions. Consistently, the response of folks working within this realm has been to provide assistance readily and enthusiastically. Looking at the sustained success of PT delivery at CommunityHealth has been helpful. The physical therapy provision there has been in place for approximately 20 years. The services are offered for four hours once a week. The program was started by Sandra Levi, PT, PhD, and Demetra John, PT, PhD, who continue in their volunteer status. Dr John, who is a member of our current committee, stated that over the years there has been a group of approximately 10 to 12 therapists who have provided services. When I spoke to the staff at CommunityHealth six months ago, they said there was a longer than nine-month waiting list for physical therapy. Due to this delay in possible treatment, physical therapy was often not a treatment option for acute care. Since that time, four physical therapists have started, myself included, and the wait list is fortunately decreasing. When Doctors Levi and John were interviewed three years ago about their 20-year history in pro bono work, they said the impetus for starting came naturally. “Those who receive should give. The profession of physical therapy rewards its members with satisfying work, and opportunities to learn and grow. We physical therapists have the capacity to make the world a better place. Even if we cannot meet all of the rehabilitation needs for those who could benefit, each of us can improve the well-being of some persons who lack the financial means to purchase our services.” They began their work before our Code of Ethics required this action. Both agree that their personal expectations and levels of satisfaction have been exceeded in recognizing that what was started casually in 1995 has sustained and grown. Yet this is nowhere near enough to meet the need for this geographical area. Efosa Guobadia, DPT, is the originator of PT Day of Service and currently CEO of Move Together (www.MoveTogether.org). The mission of this organization is “To increase access to quality rehabilitation around the corner and around the world.” They aim to do this by increasing the quality and quantity of clinics, empowering clinicians, and catalyzing servant leaders. This group has a wealth of information passionately given to assist us in pro bono work. The delivery of physical therapy is a privilege and a business. As professionals, physical therapists have a unique skill set. We are privileged to be allowed to practice our trade and interact on a very personal level with our clients. We are in a position to offer our talents, gifts, and services to improve the world client by client. We are typically paid well for our service. The business side of our actions requires financial responsibility to produce income sufficient to cover cost. Although we have an ethical responsibility to provide pro bono work, this should not be done to a level of resultant business failure. As one’s business or personal income increases, we should increase our return and commitment back to the community. Pro bono care must be delivered in compliance with legal and ethical mandates. Underbilling and not collecting copays does not constitute pro bono work and in most cases is illegal. Writing off bad debt is also not defined as pro bono work. Care and consideration of how your practice will provide pro bono work should be clearly defined to avoid making arbitrary decisions on a case-by-case basis and potential legal trouble. Resources are also available through APTA to clarify our role in the provision of pro bono work (www.apta.org/ProBono/Considerations). It is typically believed that it is better to learn a lesson late in life than not at all. I regret that pro bono work was not a part of my career until now. It is my goal to simplify this process for future generations of physical therapists in order to make it easier for what I believe will be an expected part of their career to begin. I am hopeful that in the future physical therapists and physical therapist assistants will develop the heart to make pro bono care an integral part of their professional life. Employees who are struggling to make ends meet and private practice owners concerned about their bottom line may tend to translate working pro bono as working “for free” or “for nothing.” Once they have the means to do so, however, I hope they will regard working pro bono not as working “for nothing” but in its true meaning: working for the public good. 1 Illinois Association of Free and Charitable Clinics; nafcclinics.org. Accessed December 2018. 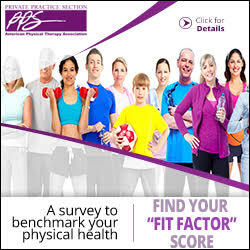 Phyllis D. Levine, PT, DPT, is a PPS member and former owner of Functional Therapy and Rehabilitation, PC, in Homer Glen, Illinois. She can be reached at phyllis.levine1@gmail.com.